Coordinated by Esri's international distributors and the company's international and education teams, the Esri Young Scholars Award program was successfully launched this past spring, with winners honored at the 2012 Esri International User Conference. The program recognizes the exemplary work of current undergraduate and graduate students majoring in geospatial science disciplines at international universities. Winning entries are selected by a university panel formed by Esri's distributor in the recipient's respective country. Award winners traveled to San Diego to present their work and join more than 15,500 GIS professionals in a weeklong program of presentations, workshops, and social events. This year's Young Scholars Award recipients include Víctor Manuel Catalán (Spain), David Haberkorn (the Netherlands), Kristen Fjeldstad (Norway), Pavel Sapanov ( Russia), Dong-hyeon Yoon (South Korea), Zelalem Amdie Mekonnen (Canada), Paulina Ansaa Asante (Ghana), Fahad Dashti (Kuwait), Xiaomeng Li (China), Esiquio Iglesias (Panama), Shun Kawakubo (Japan), and Marius Appel and Holger Hopmann (Germany). Winning projects spanned a wide range of topics. Víctor Manuel Catalán has completed a master of GIS degree facilitated by Esri España Geosistemas S.A. Previously, Catalán earned a postgraduate degree in surveying from the Universidad Politécnica de Madrid. For his final project, "BlackSpots: The analysis of national highway risks and conditions using WebGIS," Catalán used ArcGIS Spatial Analyst, Network Analyst, and 3D Analyst to develop a web application that allows the quick visualization of known highway black spots throughout Spain. Watch the related video. The application assesses potential road hazards by analyzing a database of previous accidents and known black spots. The user can explore alternative routes between specified locations, if desired. 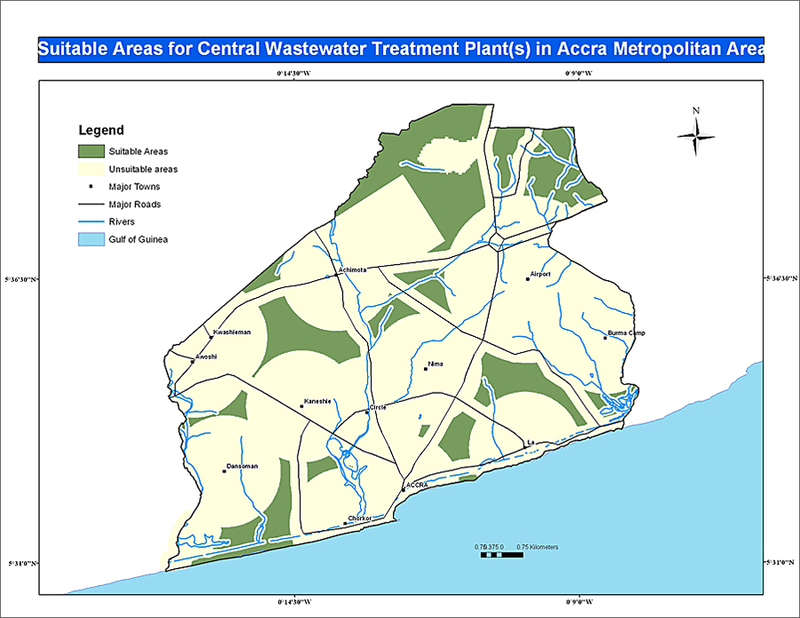 Paulina Ansaa Asante's project, "Site Suitability Analysis for a Central Wastewater Treatment Plant(s) in Accra Metropolitan Area Using Geographic Information System," presented a site suitability analysis for a central wastewater treatment plant using ArcGIS technology. David Haberkorn, master of geoinformation science graduate from the Wageningen University and Research Centre in the Netherlands, collaborated with the Scandinavian Brown Bear Research Project (SBBRP) team in his study, "Spatio-Temporal Analysis of Brown Bear (Ursus arctos) Interactions in the Mating Season." Haberkorn used four years of GPS trajectories of brown bears in Sweden tracked during their mating season to learn more about their behavior. "The big datasets [up to 1,000,000+ point locations per year] and the batch processing [up to 58 tracked bears] posed quite a challenge regarding model building/scripting, as well as processing times," says Haberkorn. "In the end, I got very nice results, though, which were validated by experts from SBBRP, who determined that the study provided new knowledge about the brown bear mating behavior." Kristen Fjeldstad recently completed his master's degree in human geography and GIS at the Norwegian University of Science and Technology. 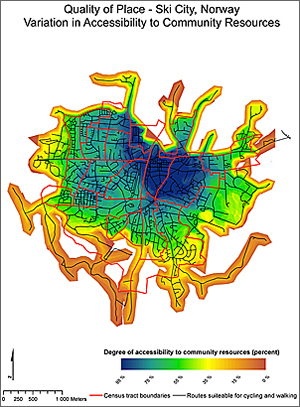 For his thesis, "Geographic Variation in Access to Community Recourses: Expert Assessment Versus Subjective Assessment of Quality-of-Place in Ski City, Norway," Fjeldstad used ArcGIS Network Analyst and Spatial Analyst to assess quality of place and its relationship to community resources. He plotted his results on a dasymetric map. In the future, Fjeldstad hopes to work in urban planning using GIS as a tool for decision making and urban analysis. "I would like to investigate how subjective assessments, such as crowdsourced data, can be better integrated into the decision-making process for urban planning," says Fjeldstad. Zelalem Amdie Mekonnen, a PhD candidate in the department of Renewable Resources at the University of Alberta in Canada, is studying ecosystem modeling and climate change using Ecosys, a terrestrial ecosystem model developed by professor Robert Grant, and Esri's ArcGIS Spatial Statistics and Spatial Analyst tools. For more information about the Ecosys model, watch the YouTube video. Mekonnen's project, "Modelling Spatial and Temporal Patterns of Carbon Dynamics in North America," examines the processes and factors that control ecosystem productivity in North America (including the Canadian Arctic) under current and future climatic conditions. "Projections show that the carbon dioxide level in the atmosphere has increased from 290 ppm in the preindustrial period to a current level of 390 ppm and is expected to increase to 450 ppm by 2050," says Mekonnen. "Therefore, understanding the processes and impacts of climatic variables on the global carbon cycle is crucial in understanding climate change impacts on the past, present, and future ecosystem productivity." The winning entry from Russia was submitted by Pavel Sapanov, a graduate student in the department of geography at Moscow State University. His project, "Expansion and Shrinkage of Transport Space of Russia," explores the rail and air transportation services availability for passengers in the Russian Federation, commonly known as Russia. The largest country in the world, Russia has an area of 17,075,400 square kilometers (6,592,800 square miles)—nearly five times the size of the United States, including Alaska. Sapanov's study period ranges from 1985 to 2012, which includes the dissolution of the Union of Soviet Socialist Republics (USSR) in 1991. "In the recent historical past, the studied countries used to be one state, with a strong interrelationship due to its comprehensive transportation systems and common sociopolitical and economic goals," says Sapanov. "I wanted to study the disproportions and changes of passenger availability of rail and air transport throughout Russia from the period before the dissolution of the USSR until present day." Kristen Fjeldstad's thesis, "Geographic Variation in Access to Community Recourses: Expert Assessment Versus Subjective Assessment of Quality-of-Place in Ski City, Norway," used ArcGIS Network Analyst and Spatial Analyst to assess quality of place and its relationship to community resources. Korean doctoral candidate Dong-hyeon Yoon studies at the University of Seoul in the department of geoinformatics. He developed an online, three-dimensional decision support system to create model simulations and analytical reports for potential city development by smaller cities that don't have their own GIS departments. His project, "3D Decision-Making Support System for Cities," was developed with Esri's ArcExplorer (Java) and uses ArcGIS for Server to manage geospatial data and services. The project will soon support various platforms, such as web-based services, Android, and iOS. "The system will also help small cities protect their open space because it will allow decision makers to visualize changes before construction," says Yoon. Paulina Ansaa Asante, an undergraduate student majoring in geography and resource development at the University of Ghana, won her Young Scholars Award with "Site Suitability Analysis for a Central Wastewater Treatment Plant(s) in Accra Metropolitan Area Using Geographic Information System." This project presented a site suitability analysis for a central wastewater treatment plant using ArcGIS technology. 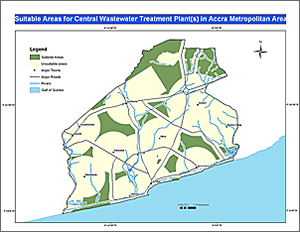 "The main objective was to identify locations suitable for the construction of a central wastewater treatment plant in the Accra Metropolitan Area to solve the problems relating to the general absence and malfunctioning of wastewater treatment plants in the metropolis," says Asante. 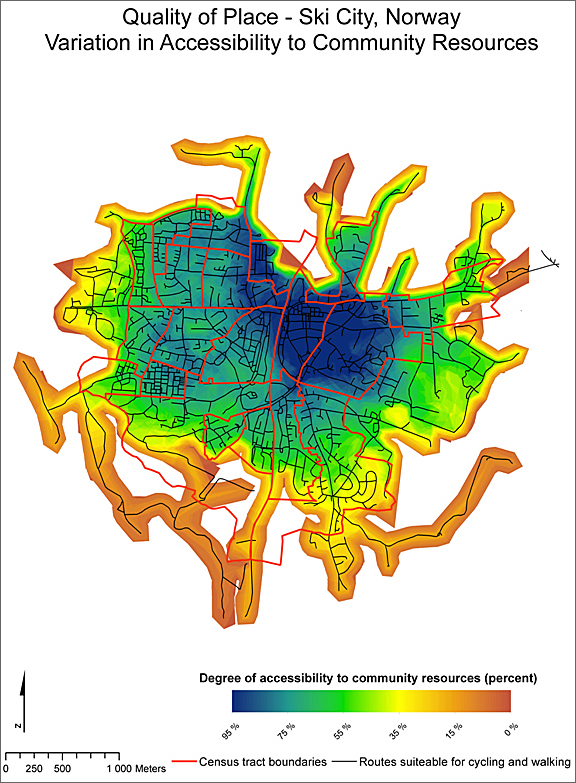 "For this purpose, several variables, such as elevation, distance to surface water bodies, land cover, distance to major roads, airport facilities, and existing populated communities, were analyzed using ArcGIS to accept or reject a particular area within the region. The result is a final composite map, which highlights the areas of interest that satisfy all relevant criteria." Fahad Dashti, an undergraduate student at Kuwait University, is studying GIS and urban planning. His project, "Using Spatial Analysis to Evaluate Banking Availability in Kuwait," examined the accessibility of banking institutions for residents of the country. To analyze the problem, he compared the population density throughout Kuwait to the location of existing banks and their proximity to major roadways, which provide the greatest access to those banks. Dashti used ModelBuilder to develop his application and determine those locations in the country lacking sufficient availability of banking services for its residents. Xiaomeng Li is a graduate student at Capital Normal University, Beijing, China, where she majors in cartography and geographic information systems. In her project, "Flood Disaster Risk and Rapid Loss Assessment in Pakistan 2010," she used the Analytic Hierarchy Process, a structured technique for decision making, to evaluate precipitation, rivers, terrain, land use, vegetation, and social economy and create a flood disaster risk assessment for flood-prone regions of Pakistan following the heavy monsoon rains in 2010. This provided technical support for the United Nations Educational, Scientific and Cultural Organization's (UNESCO) hydrology group. "Using the spatial analysis capabilities of ArcGIS, we determined the number of people and the areas of land affected by the floods," says Li. "This provided decision support information for government officials and a basis for disaster mitigation and relief." Shun Kawakubo, a graduate student in environmental issues in building and city design at Keio University in Japan, helped develop a tool called CASBEE-City, which enables a sustainability assessment of entire municipalities in Japan. CASBEE-City is based on the Comprehensive Assessment System for Built Environment Efficiency (CASBEE) methodology and tools. Kawakubo's project, "Sustainability Assessment of Whole Local Governments in Japan," uses CASBEE-City with ArcGIS to access the environmental, social, and economic characteristics of municipalities throughout Japan. "We hope that this approach will be used by the planning departments of local government to help build a sustainable future for cities throughout Japan," says Kawakubo. Marius Appel and Holger Hopmann, graduate students in geoinformatics at the University of Münster in Germany, created the project "Development of an Interface Between R and ArcGIS for Spatial-Temporal Interpolation." R is an open source programming language and software environment for statistical computing and graphics. The R language is widely used among statisticians for developing statistical software and data analysis. "Using this interface, ArcGIS geoprocessing tools can be written directly in R with a few new annotation keywords but without using any other intermediate language, like Python," says Appel. The interface also allows users to publish new research results in ArcGIS. "Our implementation makes use of the ArcObjects SDK, and with the help of the Multidimensional toolbox, the netCDF format is used internally for sharing input and output data of the geoprocessing tools between R and ArcGIS," adds Hopmann. "The Esri Young Scholars program is one of many examples of a good idea suggested by an Esri customer," says David DiBiase, Esri's director of education for industry solutions. "Dr. Kwang-Eun Kim of the Korean Institute of Geoscience and Mineral Resources suggested to Jack Dangermond in 2011 that promising students of the geospatial sciences from around the world be acknowledged at the Esri International User Conference. As I accompanied this year's winners at the awards ceremony in San Diego last month, several remarked that the occasion will be a 'lifetime memory' for them, proof positive of a good idea!" This lifetime memory is best expressed by Li: "Winning the Esri Young Scholars Award is a milestone for me. I receive this honor with deep gratitude and great humility. It is an affirmation of my previous work and will inspire me to continue to work hard in the future." Michael Gould, Esri's global education manager for Europe, the Middle East, and Africa, indicates that he is looking forward to meeting next year's Young Scholars Award winners at the Esri International User Conference. Says Gould, "Esri's international distributors will work with their national education representatives to select Young Scholars candidates for 2013." For more information, contact Michael Gould, Esri's global education manager for Europe, the Middle East, and Africa (e-mail: mgould@esri.com).